Heinz Fischer was born on 9 October 1938 in Graz, Styria, Austria. He is an Austrian politician. He took office as 11th State President of the Republic of Austria on 8 July 2004 and was re-elected for a second and last term on 25 April 2010, leaving office on 8 July 2016. Heinz Fischer studied law at the University of Vienna, earning a doctorate in 1961. Apart from being a politician, Fischer also pursued an academic career and became a professor of Political Science at the University of Innsbruck. From 1963 to 1975 Heinz Fischer was Secretary, and from 1975 to 1983 Executive Chairman of the Social Democratic Party in the Austrian Parliament and from 1971 to 2004 a member of the Austrian National Assembly. Fischer served as Minister of Science of the Republic of Austria from 1983 to 1987 and as President of the National Council of Austria from 1990 to 2002. Between 1992 and 2004 Heinz Fischer was also Deputy Chairman of the Party of European Social Democrats (PES). From 1995 to 2002 he was President of the National Fund of the Republic of Austria for the Victims of National Socialism. In January 2004 Fischer announced to run for presidency. He was elected on 25 April 2004 as the candidate of the Social Democratic Party. He polled 52.4 per cent of the votes. Fischer was sworn in on 8 July 2004. He suspended his party membership for the duration of his presidency. In April 2010, Fischer was re-elected as President of Austria, winning a second six-year term in office with almost 79% of the votes. After two terms as Federal President of the Republic of Austria and more than 40 years in public office Heinz Fischer retired in July 2016 as Head of State and was succeeded by Prof. Alexander Van der Bellen. In June 2016 Heinz Fischer was named president of the Association of Austrian Adult Education Centers. 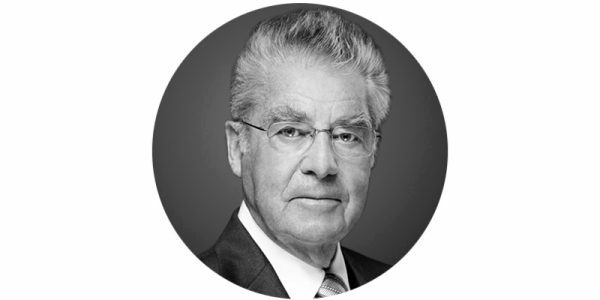 Since September 2016 Heinz Fischer occupies the position as president of the Austrian Society for Chinese Studies. In October 2016 Heinz Fischer was appointed chairman of the Advisory Council for the Commemorative Year 2018 as well as being named guest professor at the University of Innsbruck. In January 2017 Heinz Fischer was named president to the Board of the Institute for Human Science and in August 2017 Heinz Fischer was appointed as co-chairman of the Ban Ki-moon Centre for Global Citizens. Heinz Fischer wrote several books in the field of political science and contemporary history. Heinz Fischer is married to Margit Fischer (born Binder) – they have one son, one daughter and three grandchildren.